8.5 x 11 inches, 110 pages, with over 100 full color paintings. Available in hard and soft cover | This collection of paintings reflects Thomas' love for nature and expresses the way light plays across the landscape. The 100 gorgeous full color reproductions offer inspiration to artists and collectors alike, and the work ranges from brilliantly lit landscapes, to the figure, to intimately arranged still lifes. This book is certain to delight those who already collect Kitts' art and serve as a beautiful introduction for those who are new to it. Free 46 page digital PDF file, suitable for viewing on tablet and computers, illustrated with full color paintings and close up details | This digital booklet contains two second-hand accounts of Sargent's teaching and painting methods, as recounted by the Honorable Evan Charteris, K.C. in his 1927 biographical book, "Sargent" (now out of print). 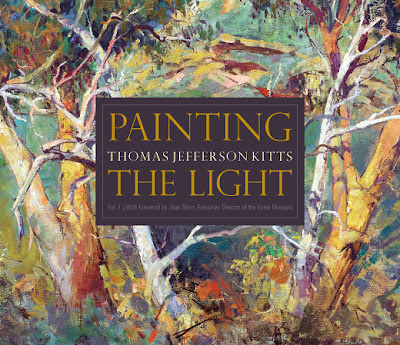 Annotated by me, Thomas Jefferson Kitts, with an essay on Sargent, plus selected paintings by Sargent used to illustrate the text. Free and available to share with your friends! Really enjoyed the article on Sargent article. Well done! And, thanks. Tom, you are a real treasure. Thanks so much for the professional insight into Sargent's style and technique. It's a must read for anyone interested in his paintings.